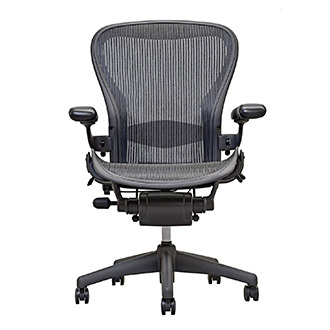 Herman Miller are one of the international leaders in office seating equipment. If you’re looking for the best chairs, then something from the Herman Miller range will certainly fit the bill. Herman Miller is a US based office equipment manufacturer with a reputation that exceeds expectations. The chairs are extremely comfortable and durable, often coming preassembled, the Aeron does require some assembly, lowering the cost of the product slightly, although still maintaining an elite status. Often one compares the weight of a product to how sturdy and comfortable it was going to be. If we did that with the Herman Miller, its 55 pounds, while not light, would not make it the most comfortable. Herman Miller however put a lot of focus on their materials as well, meaning they can use superior lightweight technology to provide us with a great experience. While only offered here in a black option, it is also possible to purchase the chair in a dark and a light gray. To ensure that you buy a chair that fits you, Herman Miller have a chair size fitment reference sheet. They have the option of three different sizes (A, B and C). Each size is recommended for people of different heights and weight. When purchasing for yourself be sure to select the right one. They have chairs that support people up to 350 pounds, with a height from 4 foot 8, all the way up to 6 foot 7. Herman Miller products are all about comfort and form. They both look beautiful and feel comfortable. While neither the seat nor the backrest feature cushions, and are covered in a special mesh material, both offer a number of features to ensure you are still supported. The backrest features a PostureFit SL technology that is adjustable and has individual pads which support the sacrum and lumbar regions of the spine. To continue the trend of support the mesh throughout the chair is tensioned into 8 different zones to properly support the different areas of your body. Many will lament this product’s lack of headrest, and we feel for the price it should have been included. However, you’re not at a complete loss, and an optional Herman Miller headrest can be purchased that neatly fits onto your Herman Miller Aeron chair. A pneumatic cylinder with side paddle lever is used to adjust the height of the seat, while a long stem with knob can be rotated to adjust tilt tension. On the, sides the armrests height can be adjusted quickly by lifting and lowering a locking lever. Armrests can further be rotated inwards and outwards for perfect placement. While everyone should strive to have a Herman Miller chair as their primary seating choice, the extreme price tag sadly puts it out of most people’s reach. 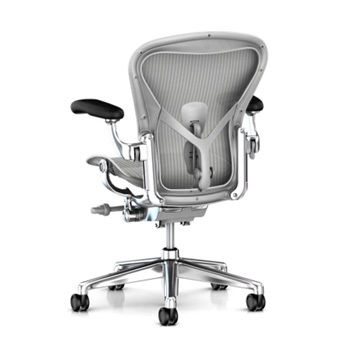 If however you are able to afford such a chair, the Herman Miller Aeron is a great choice. With an advanced design, guaranteed comfort and 10-year warranty, this chair will keep you from wanting to stand up.